Philips has recently announced its new 800 series and 9000 series HDTVs as well as Cinema 21:9 set which announced last month, will have built-in access to the Internet. The service will be called as Net TV that allows users to browse the Internet using their remote control. 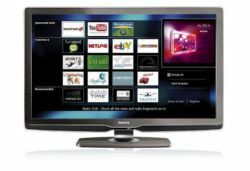 Philips has cooperated with several popular websites for custom-tailored the site to be viewable through the TVs with larger text, simplified interface and layout. The websites include YouTube, TomTom, eBay, MeteoGroup, Funspot, MyAlbum and Netlog. Beside these websites, other websites also allow for viewing but the quality of layout may not compatible with the TV. Philips also plans to add more compatible websites, including non-English speaking countries such as France, Germany and the Netherlands. According to the company, 8000-series is required a wired Internet, while the 9000-series and Cinema 21:9 is Wi-Fi enabled. Net TV is expected to be available in April.